Three of three kittens still alive. They will be a week old tonight. I should be able to get photos next week, if they don’t look malformed or on the edge of the abyss. It’s hard to tell still as they look like furry sandworms. This is a compilation of links I fell across from yesterday and today. No big sweep done today. Maybe Debbie’s idea of a dialogue is sending 140 characters to complete strangers who never reply. Do Free Services Have an Obligation to Users? Should We Regulate Them? Academia isn’t Broken. We Are. And comics are still the most expensive entertainment out there. Let me set the stage here. The post I’m linking to is written by Chuck Hollis, who is the VP Global Marketing CTO for EMC Corporation. He is not a newbie, nor is his family. This is the best iPad reaction post I have read so far! Within four hours, my wife was playing with the photo app, and sending pictures to people — she’d be meaning to do so for a while. Tap, tap, tap. She was doing that from the back porch with a frosty adult beverage to complement the activity. Forget all the BS spewing right now from the Apple camp. What’s really at the basis of this fight is the future of electronic books. The dividing line between Apple and Google will come down to books. SECOND UPDATE: See past crossed-out text! UPDATE: Archos expert Charbax is insisting in a Comment at the below linked post that the Archos 7 Home Tablet can indeed handle the same codecs as the Archos 5 Internet Tablet. After doing this post, I looked at this a bit more closely and Archos is using the same icon for Video on both the 7 and the 5, which makes me wonder if it’s the same video player in both. I have emailed Archos US PR, but have not heard back. 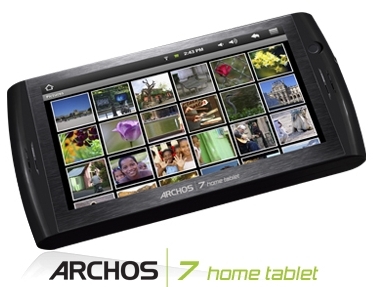 … the Archos 7 Home Tablet is the first Android-based tablet on the market with a 7-inch screen. 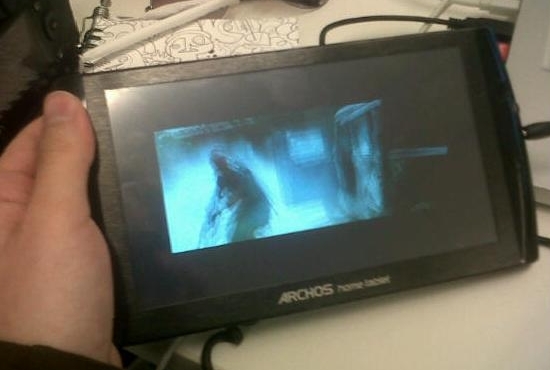 It’s also the first time Archos has released a media tablet like this that runs 100 percent Android (version 1.5) with no intervening software for handling multimedia playback or to assist with e-mail. Let me cut to the chase here. That means it will not have the Archos video software available on the current Archos 5 Internet Tablet. This means the 7HT will not be able to play DiVX/XViD AVI video. One-hundred percent Android restricts video to 3GP and MP4. This is a major, massive FAIL by Archos. I was going to buy one of these for all the AVI video I have. The screen would seem like IMAX to me, compared to my current LifeDrive screen. And US$199.00 was a great price for that. But without that AVI capability, this tablet is now worth US$0.00 to me. It’s incredible, that CNet got this so very wrong! Joanna Stern volunteered to play an XViD AVI clip I grabbed off the Net and emailed to her. It worked! Joanna cautions that we should all wait for her review before ordering it, however! Once that review is up, I will link to it both here and in a new post. For the time being, getting such critical information wrong is simply inexcusable. I don’t know if CNet was sloppy or if Archos failed to communicate the full video capabilities of this tablet. It’s significant that it can do the same video formats as the Archos 5 Internet Tablet — because that playback software is exclusive to Archos. For more upcoming information, see Best Tablet Review and an upcoming review by Joanna Stern at Engadget. All of you writers placing things on Scribd, the Kindle Store, Smashwords, and the like — did you check the contracts/Terms of Service you were signing/agreed to? If one of you hit it big, what exploitation rights did you wind up giving away that would let a third party cash in on your new popularity when you’d rather not have them do so? Today I happened to go to Scribd — which is supposed to pull the switch on a big change sometime today — and looked at the Terms of Service. Oh yeah, there’s a Gotcha! in it.